Reconstruction of the first schoolhouse in Ohio at Schoenbrunn Village. The original school was built ca. 1772 in New Philadelphia, Tuscarawas County, Ohio. The photograph was taken ca. 1940-1949. There were limited educational opportunities in the Northwest Territory and Ohio once it became a state. Mothers educated their children at home, although there were a number of schools founded in towns and villages. The settlers believed that schools would have a civilizing influence on Ohio. At this time, there were no public schools. Parents had to pay tuition for their children to attend school or work out a trade of some kind. Both men and women taught in these early schools, but women were commonly paid less and did not usually continue to teach once they married. 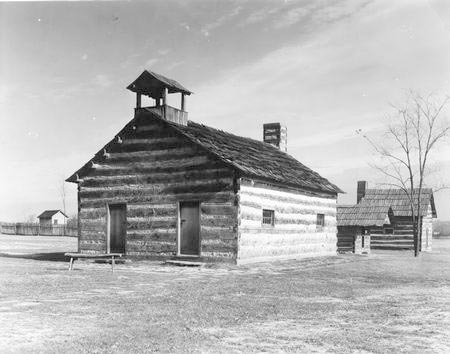 The first school was built in Marietta only a year after the settlement was founded, but other communities also viewed education as an important priority and quickly established schools. The type of education that children received in these schools was limited. The schools taught basic skills in reading, writing, and mathematics. Teachers also usually stressed good manners. Because boys were needed to help in the fields, schools were open for a few months a year, usually in the summer. Most students did not obtain any more than an eighth-grade level of education, and many never graduated. There were no laws requiring students to go to school during this era, and parents often needed their children to help with farm chores. In 1822, Caleb Atwater successfully lobbied the legislature and Governor Allen Trimble to establish a commission to study the feasibility of creating public or common schools in Ohio. The Ohio government would finance these institutions. Atwater served as chairman of the commission, with Representatives John Collins, James Hoge, Nathan Guilford, Ephraim Cutler, Josiah Barber, and James Bell also serving. The commission spent the summer and fall of 1822 researching the condition of Ohio's educational system, as well as studying public education in other states. Atwater wrote three pamphlets one on the condition of school buildings in Ohio, one on the type of public school system Ohio should create, and one on the value of common schools to Ohio's future to educate Ohioans on the need for state financed education. Atwater modeled his plan after New York's public school system. According to Atwater, Ohio should not finance schools through taxation but through the sale of state property. Not all members of the commission favored Atwater's plan. Guilford and Bell advocated a property tax. They felt that the sale of public lands would not necessarily provide the funds needed to pay for the schools. A property tax would result in a consistent inflow of money to guarantee adequate funding of the schools. The commission made its final report to the Ohio General Assembly in 1823. The legislators, for the most part, opposed public funding for internal improvements and public education. In the General Assembly's session in 1824, public opinion forced the legislature to address the education issue. Guilford took the lead, advocating a property tax to finance education. The legislature concurred, establishing common schools in Ohio in 1825. At this time, the state government financed public education with a half-mil property tax. With the establishment of public education in Ohio, communities now formed school districts to meet the state legislature's requirements. In 1829, Cincinnati established The Board of Trustees and Visitors to oversee its school district. Each political ward of Cincinnati had one elected member serving on the board. For the first two decades of public education in Cincinnati, there was no superintendent. This changed in 1850 with a new state law requiring the election of a superintendent for each school district in Ohio. Nathan Guilford won election in Cincinnati. He served as the district's first superintendent from 1850 until 1852. Initially, attendance in school was not mandatory for Ohio's children. This changed in 1921, when the Ohio government implemented the Bing Act. This law required all children between six and eighteen years of age in the State of Ohio to attend school. The legislature made two exceptions. First, children who had already graduated from high school did not have to remain enrolled in school. Second, once a child reached the age of sixteen years and had passed the seventh grade, the student could work as a farmer rather than attend school. In addition to these stipulations, the Bing Act also established sixteen years as the minimum age for employment in most industries. Since the creation of public schools in 1825, Ohioans have debated how best to fund public education in the state. Property taxes have been a major means to finance public schools, but many people claim that such a system is not fair to all students in Ohio. In 1991, more than five hundred school districts in Ohio filed suit in the Perry County courts against the state government for failing to provide them with adequate funding to educate the state's students. The case was known as DeRolph v. State of Ohio and was named for Nathan DeRolph, a student in the Sheridan Public School System in 1991. The districts claimed that the state government failed to provide an efficient educational system, as dictated by the Ohio Constitution of 1851, by relying so heavily upon local property taxes to fund schools. The districts contended that school systems in areas with higher property values could much more easily meet the needs of and provide more opportunities for their students, while students in poorer areas suffered. In 1994, Perry County Court Judge Linton Lewis, Jr., ruled that "public education is a fundamental right in the state of Ohio" and that the state legislature had to provide a better and more equitable means of financing education. Lewis' decision overturned an earlier Ohio Supreme Court ruling from 1979. The state government appealed the decision to the Fifth District Court of Appeals, which overturned Lewis' decision, stating that he did not have the power to overturn an Ohio Supreme Court decision. The school districts then filed an appeal with the Ohio Supreme Court, which agreed to consider the case in 1996. The next year, the court ruled that Ohio's current way of funding schools violated the Ohio Constitution. The justices ordered that the state government enact a constitutional school-funding system. Unfortunately for state officials, the Ohio Supreme Court provided no real guidance on how to create a constitutional school-funding program. The legislature, instead of implementing an entire overhaul of the system, simply authorized more state funds to schools. In 2000, 2001, and 2002, the Ohio Supreme Court ruled again that the school funding process in Ohio remained unconstitutional, but the court eventually determined that the Ohio government had made a good-faith effort to change public school funding, and the justices overturned their earlier rulings. Critics of school funding in Ohio remain active in calling for a complete overhaul of the system and an end to the heavy reliance upon property taxes.